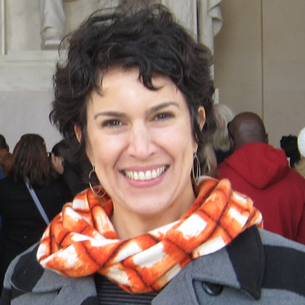 Maria Mortati is a Museum Exhibit Developer and Project Planner. She lives and works in the Bay Area on a variety of projects that span the temporary to long term, and are often experimental in nature. I have a BFA in Studio Art from the University of Colorado in Boulder and an MFA in Design from Stanford University. I also spent some time in between those two degrees studying graphic design. I learned User Interface design on the job in the 90’s and taught in HCI (Human Computer Interaction) and basic mechanical engineering design classes at grad school. I was always interested in art, drawing, and design from a young age. My parents took us to museums, as did my school, sometimes unrelentingly. They let us know this was important in some way, even if I wanted to (and did) kick my brother. Museums and galleries became my go to place as a young person. As a teenager, contemporary art museums especially resonated. Modern art at that time was still “modern”. I used to haunt the galleries in Greenwich Village and go home at night with my friends and draw. Nerds, I know. After the inevitable post-BFA pay-the-rent-jobs, I worked in visual and user interface design for about a decade. It was fun, I learned a lot about engagement, identity, and teamwork. After a while I wanted to do more conceptual work and work on larger ideas and environments than the Internet offered, so I went to get my MFA. During those 3 years I did an installation at the Yerba Buena Center for the Arts and a series of thesis projects that could be best summarized by “is it exhibit or is it art?” They were physical, highly interactive and often social in nature. From there, the melding of my new creative skills and the museum world seemed a natural next step. Given your varied background, is your approach to exhibition development different in the context of different museum types? Do you mean I take a different approach based on the project? Not really, there is always the essential getting to know you, and development phases that help structure the work. Given that these are often large projects, good fences make good neighbors. What is the San Francisco Mobile Museum project? The San Francisco Mobile Museum (SFMM) is a “pop-up” project I developed in 2009. I’ve had two exhibitions and it has shown in a number of locations, primarily outdoors in the Bay Area. The SFMM is a platform that can be broken down to fit in my car. Past exhibits have been participatory with the public responding to a theme or prompt by making something. The next exhibition will be moving away from that model, and will focus more on onsite engagement. It will be called “Observatorium” and I’ll be posting about its progress on our blog. Tell us a little bit about how your mobile projects inform your exhibit design work? They help give me some grounding in reality. My work projects tend to span years into the future and don’t offer much room for experimentation. However, there is often a lot on the line. Having the SFMM there to test things out gives me some solid experience (if even on a tiny scale) with an idea or an approach. It’s not that I’m exactly testing out an idea for a specific project, but if I want to be a part of the conversation, then I need to be participating in the conversation. A project I did in 2010 with Machine Project at the Hammer Museum (The Giant Hand) was also very important in terms of how it shaped my professional perspective and gave me insights. I had a chance to be both artist and designer, so I stumbled into some unique issues and challenges that museums face and got to be creative while doing it. The report recently released by Machine Project on the above-mentioned residency at the Hammer Museum. And not just because I’m in it! It’s a great resource for exploring the potential of a museum. Exhibit developers come in all types- that's’ good because museums do too. So there is no one compendium I turn to, but I do visit a lot of museums, take pictures, and write about it when possible. It’s good to always be developing a repertoire of experiences. What advice would you have for fellow museum professionals, especially those from smaller museums, in bringing aspects of storytelling into their exhibitions? Storytelling or narrative is a tool or technique that is quite powerful- when dealing with human stories (as we often are). They are the glue that can give a visitor a point of access into a world of ideas. With the SFMM, we let the visitors “tell” their own stories about their objects, but we provided the framework. Another project that did this very well was the Denver Community Museum, who we collaborated with on our inaugural exhibit. It’s a good and simple mechanism to draw participants out and the public in. Storytelling isn’t the only approach. For example, Olafur Elliasson’s work: would it be more impactful if it had a storyline? Each work, exhibit, or installation has its own set of options. The bigger question that helps sort out which way to go is what is your ultimate goal for this exhibit? There is a logic that flows from there to help drive which techniques to play with. I tend to approach exhibits with the question: what can I do that would be fun or innovative to explore this idea? For the visitor, the institution, and of course, myself. For smaller museums, determining the best impact you can have with your resources at hand is the central challenge and their greatest source of strength. It is their key differentiator. Edit down to a few powerful ideas and then save the others for another exhibition. Then find the most impactful technique to bring that choice to life. I think museums need to excel at creating and joining ideas in ever-freer ways, and less focused on traditional notions of silo-ed curation and exhibition. I’m not alone in this idea and I’m also not saying throw our expertise out the door though. Keep it. We have established dominance in framing and synthesizing concepts, now lets get serious about “engagement”. We are uniquely poised to claim this space, but it’s been slow going due to our institutional make-up and value systems. I'm talking about a paradigm shift from collect and preserve to select and engage. If a museum could focus on one area it would be to foster an outlook that they are a place of creative production. One way to get there is by having a sense of flexibility with their content. Then having some staff that can design, develop, and produce. Be open to being sites of creation by others such as artists, scientists, thinkers and doers. This takes a sense of experimentation that is often hard to make room for, but what else are we going to do if not be the best? Oh wow that’s hard. There are so many that I see and they are incredibly diverse. For nostalgia the MoMA, for local I like the diversity at the de Young, for wonder the Exploratorium of course, and for power of story on a visit, the Bird Museum in Iceland. At the moment I’m working with the Center for Creative Connections at the Dallas Museum of Art on a new exhibition plan. They have been doing innovative work engaging the public with art, and they want to push the envelope further. I’m also working on the next iteration of the San Francisco Mobile Museum. I’d turn my garage and the apartment in our house into a collaborative exhibition residency with ongoing talks, exhibits, and studios. It would be a blast. Thanks again to Maria for sharing her insights with us! To find out more about Maria Mortati and her work, check out her website and blog.